After Meryl Streep's 16th Oscar nomination (playing Julia Child in Julie & Julia) I did a post commenting on despite Meryl Streep's many nominations, it's her performances that are strong, not the films themselves. 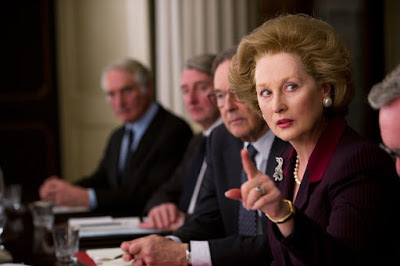 Now, receiving her 17th nomination portraying Margaret Thatcher in The Iron Lady, I feel the need to reiterate that point again. Now, of Meryl Streep's 17 Oscar nomination - only three of those films she was nominated for where nominated for best picture, and incidentally each time her film was nominated for best picture it won (The Deer Hunter, 1979; Kramer vs. Kramer, 1980; Out of Africa, 1986). And even this year in the Best Actress race, I would venture to say that if awards were the marker of a strong film (which I realize they aren't) Meryl Streep's competition is each in a debatably stronger film. The Iron Lady receives two Oscar nominations (Streep's nomination and a nomination for the less-prestigious Make-up category). Three of her contenders are in films which carry more nominations. Rooney Mara's The Girl with the Dragon Tattoo is nominated for 5 awards (primarily technical), Viola Davis' The Help has four nominations (best picture, and three female acting nominations), Glen Closes's Albert Nobbs has three nominations (two acting and make-up). The fifth nominee, Michelle Williams in My Week With Marilyn also comes from a two nominee film, but those two nominations are both acting, which I would suggest Kenneth Branagh's nomination brings more weight then the make-up nomination The Iron Lady brings to the table. But of course, nominations aren't the only judge of film. But I still thing Meryl Streep is consistent, but her choice of films leads to stand out performances in less-than-standout films.